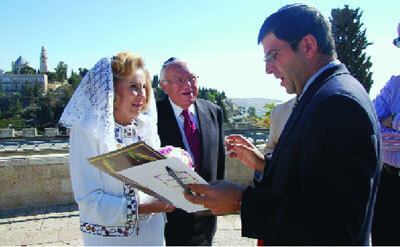 Farber (at right) also helps Americans who want a wedding in Israel. Rachel followed Itai to Israel and made aliya. They lived in Jerusalem, becoming increasingly observant. Itai proposed, and they began planning a wedding with an Orthodox ceremony, the type of wedding they both wanted—and in Israel, the only marriage legally recognized between Jews. About two months before the event, they traveled to Itai’s hometown of Migdal Ha-Emek in the Galilee to open a file in the town’s rabbinate, a routine part of obtaining a marriage license in Israel. A few days later, the town rabbi, who had overseen Itai’s bar mitzva, called them and said he had uncovered a “terrible problem”: Rachel’s Jewishness was in question. Her grandmother, the rabbi had noted after examining the submitted records, had given birth to her mother in the early 1950s when she was 40. In addition, during the licensing process both she and Itai, whose great-grandparents hailed from neighboring shtetls in Belarus, were asked for proof of their Jewishness. Rachel was even told she might have to undergo conversion. Rachel and Itai (not their real names) had become embroiled in a larger controversy. An increasingly suspicious and stringent rabbinical court system—the government body in charge of overseeing marriage, divorce, conversion and burial—is questioning the personal status of Jews, especially those from abroad. The couple found help through the hotline of a nonprofit organization called the Jewish Life Information Center, known by its Hebrew acronym, ITIM. Founded eight years ago by New York-born Orthodox Rabbi Seth Farber, ITIM helps Jews navigate the rabbinate’s bureaucracy. ITIM fields 600 calls a month through its 24-hours-a-day, six-days-a-week hotline. The ITIM Web site, htttp://eng.itim.org.il, which, among its offerings, has information on marriage and divorce, listings of registered mohels and a Hebrew name database, records 30,000 visitors each month. The organization also distributes booklets on lifecycle events, providing information, for example, on baby-naming ceremonies for girls. Farber, 43, is on the frontlines of the Who Is a Jew debate—trying to win what feels like a war on a case-by-case basis. In recent years, the rabbinate, increasingly under the influence of the ultra-Orthodox community, has begun applying that community’s stricter standards in deciding status issues. For instance, the rabbinate now may look for an Orthodox Jewish connection before approving a marriage license; while this is not a problem for native Israelis, it is often difficult for the majority of American Jews. Farber feels he is often cast in the role of Sherlock Holmes. Tenacious in clarifying people’s status, he has built connections with rabbis and officials in Israel and the diaspora as he advocates for those stuck in the system. Volunteers in the United States sift through Ellis Island records, the American Jewish Yearbook, census information, oldyortzeit records and visit cemeteries for clues. “We’ve even called crematoria,” Farber said. He recalls the case of a woman who had been divorced in the United States in the 1960s and received a Conservative get. She moved to Israel, remarried and had four children. When her children wanted to marry they were asked for their mother’sget, but it was rejected because it came from a Conservative rabbi. The four were under threat of being declared mamzerim, marking them as unable to marry Jews under Jewish law. Farber contacted his network in the United States to find the name of the rabbi who oversaw the divorce, discovering that he was traditional enough to pass muster with the rabbinate. Farber then approached the chief rabbi with the new evidence. “It’s the kind of thing I can do that no one else would have the legitimacy to explore,” said Farber, who with his silver-framed glasses has the look of an academic. He is also the great-great-great-grandson of Moshe Sofer, known as Hatam Sofer, a leading rabbi in early-19th-century Central Europe and a father of ultra-Orthodoxy. It is an interesting question whether his esteemed ancestor would approve of Farber’s organization. However, Sofer might indeed have paused when confronting Farber’s chilling defense of his work: If mistrust between the rabbinate and rabbis abroad continues to fray—and the rabbinate will no longer believe a diaspora colleague’s testimony about an individual’s Jewishness—then thousands might get written out of the Jewish world. The other major focus for ITIM is conversion. “The conversion issue has kept us very busy,” said Shlomit Solomon, who works on the hotline. “A lot of people going through conversion are in real need of information. They are scared, feel lost. “People ask, for example, ‘Will my conversion be recognized?’ Often no one gives answers and that is where we come in,” said Solomon, 32, who is modern Orthodox. ITIM recently helped Michael Halika, a former Olympic swimmer, and his wife, Katya, who emigrated from the former Soviet Union in 1991. Her maternal grandfather had been Jewish and she converted, but the rabbinate refused to issue her conversion certification papers for 13 months, during which time she became pregnant. At one point there was an attempt to annul her conversion. ITIM lobbied the prime minister’s office and the rabbinical court. Eventually, the court backed down, issuing her a conversion certificate. Farber recited the blessings over their son during his bris this past year. “If Rabbi Farber had not been there and ITIM did not exist, I do not think [my wife’s] conversion would have gotten finalized,” said Halika. He had been so outraged by the entire experience that he had contemplated leaving Israel for Australia. Recently, ITIM became embroiled in Israel’s conversion wars. Farber petitioned the Supreme Court on behalf of a couple seeking to marry; local rabbinical courts had refused to issue them a marriage license because they did not recognize their conversions, which had occurred in the Israeli Army. The case remains unresolved since, during the hearing, the state’s attorney found a procedural problem with the conversions. It snowballed into an ideological conflict, as ultra-Orthodox leaders, suspicious of Army conversions, pressured the rabbinate, which triggered a decision by the chief rabbinate to appoint a committee of rabbis to scrutinize the process. The rabbinate then broadened the committee’s mandate to examine Israel’s conversion process in general. The idea for an organization like ITIM was born during a hike in the Judean Desert that Farber and his wife, Michelle, took in 2000. The two were stuck in a difficult part of the hike when a young couple came by and helped them. During the course of intense conversations, Farber learned that although engaged, they had no intention of getting married through the rabbinate. “I said, ‘What if someone who respected your values said there is a place Jewish tradition can meet you?’” A few months later, he officiated at their wedding. They had also told him about the female friend, a singer, who introduced them. When Farber asked if they would like her to sing under the huppa, they were flabbergasted, thinking that would be impossible as part of an Orthodox ceremony. Ordained at yeshiva university in New York, Farber made aliya in the 1990s. A father of five, he also heads the Kehillat Netivot synagogue in the Tel Aviv suburb of Ra’anana. He is on the road frequently raising funds for ITIM. Our interview took place just after he had come back from New York. The following week he went to Boston and returned to New York; two weeks later he traveled from Washington to Los Angeles. Within the rabbinate, reactions to Farber’s work are mixed. “When… Farber started out he had good intentions,” said an official who asked to remain anonymous. “The problem is he thinks he is here to fix the world. “It’s true that when it comes to conversion issues, sometimes within the bureaucracy things do not get handled properly,” noted the official who defended the rabbinate, saying they had to uphold high standards. Another case is that of 28-year-old Leah (not her real name), a nurse from the former Soviet Union. Five years after immigrating, she and her husband divorced, receiving a get from the rabbinate even though their marriage abroad had been a civil one. She later fell in love with a kohen and wanted to marry him. But, by Jewish law, kohanim cannot marry divorcées. For months, they looked for a solution before turning to Farber. He arranged for a hearing in the supreme rabbinical court and explained the issues to the judge. The judge, with whom Farber has cultivated a relationship, issued a ruling on the spot: A get had not been necessary since she was never halakhically married; she was therefore permitted to marry a kohen. He also advised Rachel and Itai to transfer their file out of Migdal Ha-Emek, with its strange intrigues and tacit suggestions by two of the figures including the rabbi they had dealt with that a bribe might help their problem go away. With Farber’s help, the couple presented their paperwork to the religious court in Haifa. In a hearing room, Rachel approached the bench to hear the verdict: She, Rachel, was a Jew. The wedding could go on. Relieved and in tears, she and Itai called Farber, this time to share the good news.